Sam is an academic at the School of Pharmacy at the University of Queensland. She has an honorary appointment at Imperial College London (sabbatical in 2018). Her research focuses on medicines and health systems. She works with an extensive network of clinicians and health professionals to investigate the use of medicines and adverse effects in cancer, psychiatry, neurology, internal medicine, and general practice. Sam works on economic evaluations and health technology assessment (HTA). 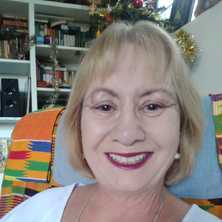 She has an active interest in health systems and health services research, with a particular focus on low and middle-income countries (LMIC) and non-communicable diseases (NCD).Sam worked as a consultant in HTA in Australia for many years evaluating submissions to subsidise medicines on the Pharmaceutical Benefits Scheme (PBS). She has worked on international health projects in Indonesia and is currently working on several HTA projects in Ghana. Sam coordinates, lectures, and tutors in undergraduate and postgraduate programs. She is an advisor on diverse PhD and student research projects. Sam has studied and worked in Brisbane (UQ), London (Imperial College), Melbourne (Monash), Toronto (Mt Sinai Hospital), and Kumasi, Ghana (Kwame Nkrumah University of Science and Technology). How are medicines used in the real world after registration and public subsidy? Are we using them in the most effective way possible? We can use routinely collected data to investigate the use of medicines and their side effects in populations. How do we decide which health services and medicines to use in our health systems? Health Technology Assessment (HTA, including economic evaluations) is a tool to help answer the questions: does it work and is it good value for money? I work with an international consortium and partners in Ghana to help them manage and allocate their finite resources to ensure their healthcare systems meet the need for universal healthcare coverage efficiently and equitably. Del Mar, C., Glasziou, P., Hollingworth, S., Sanders, S., Pirozzo, S. and Pietrzak, E. Effectiveness of clinical information services. NICS Report 17. St Lucia, Brisbane: Centre for General Practice, The University of Queensland, 2002.
del Mar, Chris, Bennett, Sally, Abell, Bridgett, Boyle, Malcolm, Hill, Kylie, Hollingworth, Samantha, Lewis, Courtney, Noffs, Gustavo, Rickard, Claire, Sanders, Sharon, Schneider, Michal, Stedeman, Inge and Vogel, Adam (2017). Questions about diagnosis: examples of appraisals from different health professions. In Tammy Hoffmann, Sally Bennett and Chris Del Mar (Ed. ), Evidence-based practice across the health professions Third edition ed. (pp. 159-184) Chatswood, NSW, Australia: Elsevier. Page, Andrew N., Swannell, Sarah, Martin, Graham, Hollingworth, Samantha, Hickie, Ian B. and Hall, Wayne D. (2009) Sociodemographic correlates of antidepressant utilisation in Australia. Medical Journal of Australia, 190 9: 479-483. In Australia are people born in other countries at higher risk of road trauma than locally born people? Hollingworth, SA, Jones, SA and Adamson, SL (1996) Rebound increase in fetal breathing movements after 24-h prostaglandin E(2) infusion in fetal sheep. Journal of Applied Physiology, 80 1: 166-175. Thorburn, GD, Hollingworth, SA and Hooper, SB (1991) The Trigger for Parturition in Sheep - Fetal Hypothalamus or Placenta. Journal of Developmental Physiology, 15 2: 71-79. Rice, G. E., Wong, M. H., Hollingworth, S. A. and Thorburn, G. D. (1990) Prostaglandin G/H synthase activity in ovine cotyledons: a gestational profile. Eicosanoids, 3 4: 231-236. Hollingworth, S., McGuire, T. and van Driel, M. (2017). Antidepressants - the unanswered questions. Analysis of a consumer medicines call centre in Australia. In: ACPE 2017, PACE, Brisbane, (). 29-31 October 2017. Sidhu, K., McGuire, T., van Driel, M. and Hollingworth, S. (2017). Consumer information gaps and concerns regarding opioid analgesics and anxiolytic/hypnotic/sedative medicines. In: APSA-ASCEPT 2017 Joint Scientific Meeting, Brisbane Convention and Exhibition Centre, Brisbane, Australa, (). 5-8 December 2017. Does consumer medicines interest reflect medicines use? McGuire, T., Pache, D., Hollingworth, S. A. and van Driel, M. (2017). Does consumer medicines interest reflect medicines use?. In: Primary Health Care Research Conference (PHCRIS), Brisbane, (). 7-9 August 2017. Natari, R. B., Clavarino, A. M., McGuire, T. M., Dingle, K. D. and Hollingworth, S. A. (2017). The bidirectional relationship between vasomotor symptoms and depression across the menopausal transition: A systematic review of longitudinal studies. In: 16th International Congress of the International Federation of Psychiatric Epidemiology, Melbourne Convention Centre Melbourne Australia, (). 17-20 October 2017. Use of hormone therapy for menopause in Australia over two decades: does the change in evidence matter? Natari, R. B., McGuire, T. M., Clavarino, A. M., Dingle, K. D. and Hollingworth, S. A. (2017). Use of hormone therapy for menopause in Australia over two decades: does the change in evidence matter?. In: ACPE 2017, PACE, Brisbane, (). 29-31 October 2017. What do consumers want to know about their medicines? Consumer queries compared to medicines use. McGuire, Treasure, Pache, David, Hollingworth, Samantha and van Driel, Mieke (2017). What do consumers want to know about their medicines? Consumer queries compared to medicines use.. In: ACPE 2017, PACE, Brisbane, (). 29-31 October 2017. Van Driel, M., Hollingworth, S. A. and McGuire, T. (2017). What do patients taking antidepressants worry about? Analysis of a consumer medicines call centre in Australia. In: North American Primary Care Research Group (NAPCRG) Annual Meeting, Montreal, Quebec, (). 17-21 November 17-21, 2017. What do women want to know about menopausal symptoms management: An Australian medicines call centre analysis. Natari, R. B., McGuire, T. M., Clavarino, A. M., Dingle, K. D. and Hollingworth, S. A. (2017). What do women want to know about menopausal symptoms management: An Australian medicines call centre analysis.. In: APSA-ASCEPT 2017 Joint Scientific Meeting, Brisbane Convention and Exhibition Centre, Brisbane, Australa, (). 5-8 December 2017. McGuire, T. M., Pache, D. M., van Driel, M. L. and Hollingworth, S. A. (2016). Does consumer medicines interest reflect medicines use?. In: Annual Conference of Australasian Pharmaceutical Science Association, Sydney University, Sydney, NSW, (). 2-5 December 2016. McKavanagh, Daniel, Walpole, Euan, Hollingworth, Samantha, Sharkey, Megan and Mollee, Peter (2015). Lenalidomide Use in Relapsed or Refractory Multiple Myeloma Patients At Five Large Queensland Public Hospitals. In: Asia-Pacific Journal of Clinical Oncology. , , (134-134). .
Trends in the use and costs of disease-modifying anti-rheumatic drugs (DMARD) in Australia. Snoswell, Centaine, Kempnich, Clinton and Hollingworth, Samantha A. (2014). Knowledge and attitudes of final year pharmacy students toward opioid substitution therapy (poster presentation). In: Medicines in Health: Shaping Our Future. National Mediation Conference 2014. National Medication Conference 2014, Brisbane, QLD, Australia, (). 21-23 May, 2014. Khanal, S., Nissen, L., Veerman, L. and Hollingworth, S. (2014). Use of inhaled anticholinergics in Australia. In: 74th FIP World Congress of Pharmacy and Pharmaceutical Sciences 2014, Bangkok, Thailand, (). 31 August - 4 September 2014. Hollingworth, Samanth A., Symons, Martyn, Khatun, Mohsina, Loveday, Bill, Ballantyne, Sue, Hall, Wayne and Najman, Jake (2012). Prescribing databases can be used to monitor trends in opioid analgesic prescribing in Australia. In: National Medicines Symposium 2012, Sydney, Australia, (). 24-25 May 2012. Jackson, Claire, Foster, Michele, Hollingworth, Samantha and Burridge, Letitia (2012). Translating research into practice: a framework for planning and guiding implementation of innovative models of care in local contexts. In: 2012 PHC Research Conference Abstracts. 2012 Primary Health Care Research Conference, Canberra, Australia, (). 18 - 20 July 2012. Chan, H. Y. H., Nissen, Lisa M., Hollingworth, Samantha A. and Steadman, Kathryn (2011). Pharmaceutical access in Australia, Hong Kong, Thailand, Vietnam, Singapore and Malaysia. In: Australasian Pharmaceutical Science Association (APSA) 2011, Adelaide, Australia, (). 11-14 December 2011. Chan, H. Y. H., Hollingworth, Samantha A., Steadman, Kathryn and Nissen, Lisa M. (2011). Views on healthcare access in Hong Kong, China, Vietnam, Thailand, Singapore and Malaysia. In: 1st Health System Reform in Asia Conference, Hong Kong, China, (). 9-12 December 2011. Chan, Ho Yan (Hidy), Hollingworth, Samantha A., Steadman, Kathryn and Nissen, Lisa M. (2011). Views on pharmaceutical access and governance in Australia, Canada and the United Kingdom (UK). In: Better public health through pharmacoepidemiology and quality use of medicine, Antwerp, Belgium, (). 30 November-3 December 2011. Chan, Hidy, Steadman, Kathryn, Hollingworth, Samantha A. and Nissen, Lisa M. (2010). Qualitative study of issues concerning pharmaceutical access, utilisation and governance in Australia, Canada and England. In: Australasian Pharmaceutical Science Association 2010, Brisbane, QLD, Australia, (). 6-9 December 2010. Chan, Ho Yan Hidy, Steadman, Kathryn, Hollingworth, Samantha and Nissen, Lisa M. (2010). The evaluation of health care systems of Denmark, England, France, Canada, The United States and Australia. In: 16th International Social Pharmacy Workshop proceedings: Communication and information in pharmacy. 16th International Social Pharmacy Workshop, Lisboa, Portugal, (49-50). 23-26 August 2010. Strategies for overcoming health system constraints in developing countries. Hollingworth S, Jimenez E and Davies P (2009). Strategies for overcoming health system constraints in developing countries.. In: 6th Health Services & Policy Research Conference, Brisbane / Brisbane Convention Centre, (). 25-27 November 2009. Chan, Hidy, Steadman, Kathryn, Hollingworth, Samantha A. and Nissen, Lisa M. (2009). Use of health-care indicators in the evaluation of health care systems around the world. In: Proceedings of the Australasian Pharmaceutical Science Association Annual Conference 2009, Hobart, TAS, Australia, (). 8-11 December 2009. Hollingworth, S. and Whiteford, H. (2008). Antidepressant medications in Australian adults. In: Population Health Congress 2008, Brisbane, Australia, (). 6-9 July 2008. Hollingworth, S., Nissen, L. and Chung, A. (2008). Psychotropic medications in Australian children and youth. In: Population Health Congress 20098, Brisbane, Australia, (). 6-9 July 2008. Hollingworth, S., Nissen, L. and Chung, A. (2008). Psychotropic medications in Australian children and youth. In: NMS 2008 program. National Medicines Symposium (NMS 2008), Canberra, Australia, (). 14-16 May 2008. Hollingworth, S, Nissen, L. and Chung, A. (2008). Psychotropic medications in Australian children and youth. In: RANZCP Faculty of Child & Adolescent Psychiatry Annual Conference: child2008 - Challenges in the Digital Age, Port Douglas, Australia, (). 12-16 October 2008. Turkstra, E., Hollingworth, S., Britt, H. and Nelson, M. (2008). Recent reduction in the use of antihypertensives in patients younger than 65 years in Australia. In: National Medicines Symposium 2008, Canberra, Australia, (). 14-15 May 2008. Hollingworth, S., Nissen, L., Duncan, E. and Gunantil, I. (2007). Osteoporosis: Use of bisphosphonates in the Australian population. In: 17th Australian and New Zealand Society of Bone and Mineral Research Annual Scientific Meeting, Queenstown, New Zealand, (). 9-12 September 2007. Hollingworth, S. A., Nissen, L. M., Robinson, M. and Hall, W. D. (2006). Trends in antipsychotic medication prescribing in Australia. In: Proceedings of the National Medicines Symposium 2006. Quality use of medicines: Balancing beliefs, benefits and harms, National Convention Centre, Canberrra, (38-38). 7-9 June, 2006. Hollingworth, S A, Nissen, L M, Robinson, M and Hall, W D (2006). Use of atypical antipsychotic medications in older Australians. In: 3rd Annual Meeting of Health Technology Assessment International (HTAi), Adelaide, Australia, (1-1). 2-5 July, 2006. Pietrzak, E., Hollingworth, S. and Glasziou, P. (2004). Partitioning of modelled benefits in pharmacoeconomic evaluations. In: National Medicines Symposium 2004, Brisbane, (). 28th to 30th July 2004. Hollingworth, S., Russell, A. and Dobson, A. (2002). Contraceptive behaviour of young women in Australia - Women's Health Australia project. In: Australian Centre for Tropical Health and Nutrition and Australasian College of Tropical Medicine: Reproductive Health, Brisbane, (). 2-6 July 2002..
Hollingworth, Samantha Anne (2002). The contraceptive behaviour of young women in Australia Master's Thesis, Pharmacy, The University of Queensland.